Funky's Flights II is the direct successor of Funky's Flights from Donkey Kong Country in Donkey Kong Country 2: Diddy's Kong Quest and Donkey Kong Land 2. It transports Diddy and Dixie to a previously visited world or location. In Donkey Kong Country 2: Diddy's Kong Quest, Funky operates a Funky's Flights II in every world except for the Lost World. Like its predecessor, Funky's Flights, it is the only other alternative for Diddy and Dixie to access a world they have previously visited. Funky allows them to do so by renting the Funky Barrel, the successor of the Jumbo Barrel. This sends them to Crocodile Isle's world map, where they can select a world and then a level of it. The screen also moves up and down slightly when the Kongs are in the location. Diddy and Dixie can use it for free when they first use the Funky Barrel in a world. For consecutive uses, Funky charges them two Banana Bunch Coins, a change from the original Funky's Flights, where DK and Diddy use it for free. This is similar to when Wrinkly first saves the game progress for free in each world's Kong Kollege but then charges them subsequently. Funky's Flights II takes place on a giant surfboard, with a wooden shack in the corner. The shack has antennas on its roof and a few objects lying outside such as a tire and a beach ball. Funky's Flights II was significantly changed in the Game Boy Advance remake. Funky no longer offers flight services but instead hosts a Funky's Flights challenge in each world. His location appears more simplistic, and Funky is repositioned from the left side of the screen to the right. The redesign makes it more evident of the location's setting on a giant surfboard. The Kongs can no longer exit a world by completing a boss rematch, which are converted into time attack challenges hosted by Swanky. 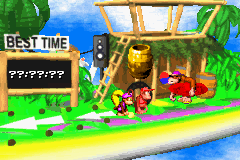 Diddy and Dixie's only option to access other worlds is from the menu's Gyrocopter option (which replaces the original version's Funky Barrel). This option is unlockable, as Funky first wants the Diddy and Dixie to prove their capability of using the Gyrocopter by completing "Aerial Loop", the Funky's Flights challenge of Gangplank Galleon. Funky's Flights II has an identical role in Donkey Kong Land 2, though the English version simply names it "Funky's Flights" on the world map. Funky's Flights II, from Gloomy Gulch's world map in Donkey Kong Land 2. World map icon in the Game Boy Advance remake. This page was last edited on December 2, 2018, at 03:46.